Produced by Ceci Dempsey, Ed Guiney, Lee Magiday, and Yorgos Lanthimos; directed by Yorgos Lanthimos; screenplay by Deborah Davis and Tony McNamara; cinematography by Robbie Ryan; production design by Fiona Crombie; costumes by Sandy Powell; edited by Yorgos Mavropsaridis; music arranged by William Lyons; starring Olivia Colman, Rachel Weisz, Emma Stone, Nicholas Hoult, Joe Alwyn, James Smith, and Mark Gatiss. Color, 120 mins. A Fox Searchlight release. British theater in the Eighties, led by such playwrights as Howard Brenton and David Hare, tackled historical events to address the Thatcherite present. In a series of works, they applied left political readings to history as a means of using theater as a weapon against British institutional power. Crucially, these weren’t staged as history lessons; they burst to life on stage in highly charged and inventive productions as modern as the texts. While this revolution was happening in British theater, it wasn’t in British cinema. Only Derek Jarman—with, for example, his Christopher Marlowe adaptation of War Requiem (1989) and Edward II (1991) and Peter Greenaway, in works ranging from The Draughtsman’s Contract (1982) to A TV Dante (1990) and—in a sly appropriation of Dutch historical events for a contemporary London setting, The Cook, the Thief, His Wife & Her Lover (1989)—explored history as a political metaphor for current events with radical cinematic means. The late Jarman’s movies contained the added frissons of radical gay politics and culture—anathema to the rising Tory wave—and Greenaway’s movies did and continue to stir outrage for his combined fascination with the body and disdain for anything resembling conventional narrative structures. In their fusions of history, politics, and radical art and culture, the pair continue to stand for a direction never taken up elsewhere in British cinema, where history remains stuck in the mode of the standard costume drama. This is the context that makes the arrival of The Favourite an important event for U.K. cinema. As an acid-dipped comic roundelay between three calculating women at the pinnacle of the short-lived royal court of Queen Anne at the start of the eighteenth century—including the ill and emotionally unstable Anne herself (Olivia Colman)—the movie singlehandedly upends decades of unimaginative habits by British filmmakers who have generally treated history as well-behaved pageants with period-perfect costumes and lavish settings. 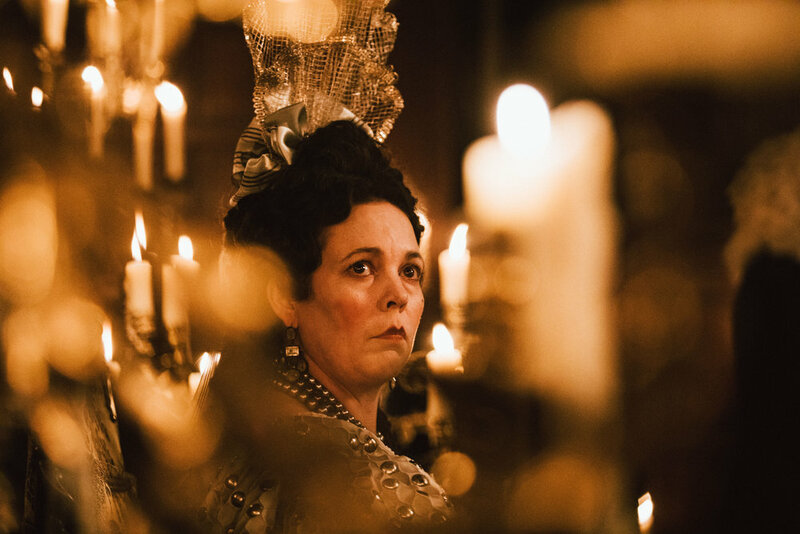 Ironically, The Favourite—which hardly lacks for fabulous costumes and grand locations—started that way. In her early drafts, historian-turned-screenwriter Deborah Davis first approached the fascinating story of how Queen Anne is played and manipulated by both her key aide—and concubine—Sarah (Rachel Weisz) and Abigail (Emma Stone), a scrappy outsider who works her way into Anne’s favor, as a straight historical drama. By her own account, Davis wrote her script as a good historian would: apply the facts, uncover the real historical characters, and tell their story. Once the Greek director Yorgos Lanthimos was involved with the project in 2009 before the premiere of his breakout second feature, Dogtooth (2009), he urged Davis to revamp her script. He also recruited frequent collaborator Tony McNamara to take the essential ingredients and characters Davis assembled and rejigger them in a different direction. 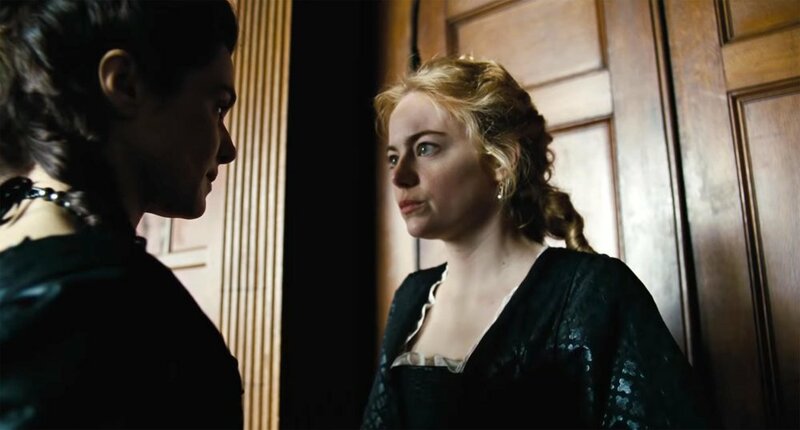 Sarah (Rachel Weisz) and Abigail (Emma Stone) in The Favourite (2018). What direction? A fascinating element of watching The Favourite is viewing it through a double lens. The first is history cinema, which doesn’t mean that you need to know the facts of this episode in Queen Anne’s reign, only that you recognize the court intrigue in the frame of Anglo-Saxon cinema depictions of British court drama, in the same way that we watch Game of Thrones through the long lens of court drama drawn from the template created by Shakespeare. The second is Lanthimos’s own cinema, which explores the absurd dynamics of power relationships inside social units, from families (Dogtooth, The Killing of a Sacred Deer ) to self-selected social groups (Alps ) to loosely related groups (Kinetta ) to regimented hierarchies (The Lobster ). Lanthimos’s early work in theater, with fellow director Rachel Athina Tsangari (with whom he co-produced her first feature, Attenberg ), drew upon tropes in physical comedy and the Theater of the Absurd—itself rooted in subverting traditional power hierarchies. Both he and Tsangari, in distinct ways, transferred this taste for the physical and absurd to the cinema, and though Lanthimos has set his stories in the present or, in the case of The Lobster, the near-future, his notion of tackling a three-hander comedy-drama in the dawn of the eighteenth century actually fits nicely into his larger conceptual project. He has nudged a by-the-book history play into a blend of Restoration comedy, Jacobean revenge tragedy, and Ionesco absurdism, an unusually promising mix of periods and attitudes that reframes a battle of hearts, desire, and pure political power. To read the complete review, click here so that you may order either a subscription to begin with our Spring 2019 issue, or order a copy of this issue.